“American Housewife”, which co-stars Columbia’s Carly Hughes, has been RENEWED for Season 2 by ABC! 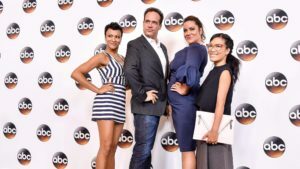 The show centers around Katie (Katie Mixon) an average wife and mother, who tries to stand out among the more wealthy housewives and privileged children of her hometown of Westport, Connecticut. Carly Hughes plays Katie’s best friend, Angela, who is going through a messy divorce. Catch “American Housewife” Tuesdays at 8:30 on ABC, or ABC.com!